Hi, Thank you friends, and viewers. Today I will post how to make foxtail millet kheer recipe. Millets are good for health. They can be consumed in different ways, make roti, dosa, kichidi or upma, and also try to make kheer with them. Foxtail millet or Korra biyyam or Korralu, I have tasted them for the first time, when we were traveling from Hyderabad to Vijayawada, in a road-side restaurant. They serve food in plantain leaves and water would be served in clay tumblers or kullad. It was really an awesome feeling like having a healthy and tasty food outside that too in a healthy way. First, they serve some dessert with millets, that day it was foxtail millet kheer. I liked it very much, it was not too sweet and nor it was heavy on the tummy. After returning from the trip, I tried it. It is very easy to make and takes very less ghee or clarified butter and we have to prepare it with jaggery which is again good for health. New bees can also make it easily without any expertise. Interestingly kids also love it very much. Wash and soak foxtail miller/Korra biyyam for half an hour to one hour. Pressure cook it for three to four whistles. Or we can cook it separately in a thick bottomed vessel also. I cooked it in a thick bottomed vessel, though it took 15 to 20 minutes time. Once the millet cooked softly add milk and jaggery to it. Give a nice mix and let the jaggery melts completely and the millet turns into a soft porridge. Add grated coconut and allow this cook for a while. Heat ghee in another kadai, fry cashew nuts and raisins till they turn golden color. Add cardamom powder to the millet porridge. Mix it well. Lastly add fried cashew nuts and raisins and give thorough mix. Isn't it so simple to make!!! 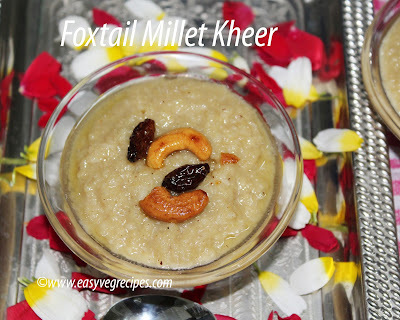 Serve foxtail millet kheer hot or warm. Thank you for visiting my blog and hope you liked all my recipes. Feedback and suggestions are welcomed. For more sweets recipes click here.